Lower: The 7075-T6 forged lower receiver is hard coat anodized, and accepts standard AR-15 fire control groups. The extended magazine release is outside of the trigger guard for safety, which allows for an AK-style release movement but also features oversize side paddles for fingertip release by the trigger finger. The KS-47 G2 receiver also accepts standard AR buffer tubes. The KS-47 G2 lower has steel reinforcements to accept AK style surplus magazines including drum-style. This Gen2 design features a PA-10 carbine buffer spring and heavy H1 buffer to ensure reliable operation with a wide variety of aftermarket and surplus magazines. This lower is finished with a Magpul Grip, SBA3 Adjustable Brace, and Mil-Spec Buffer Tube. Through extensive testing, we have determined that we can only guarantee the reliability of the KS-47 G2 platform with the PA-10 carbine buffer spring and heavy H1 buffer. The KS-47 G2 Lower will accept most aftermarket fire control groups (Geissele, etc.). However, due to the magazine catch geometry, one piece drop in triggers such as CMC style triggers will not function in KS-47 G2. Upper: The KS-47 G2 upper receiver is precision machined out of forged 7075 T6 aluminum, and then hard coat anodized for durability. While retaining the look of a standard M4 upper, the KS-47 G2 upper is designed to work with the new Gen2 KS-47 lower. The upper features integrated over-insertion tabs to prevent the bolt from dragging on the magazine. This CMV 4150 barrel is chambered in 7.62x39 with a 1 in 10 twist and has a single, large feed ramp to accommodate the larger case diameter of the 7.62x39 round. The barrel is nitride treated for accuracy and durability, and is finished off with a 5/8-24 thread A2-style compensator. The forward assist, dust cover, charging handle, and safety are all standard AR-15. This Upper is finished with a PSA 9" Lightweight M-Lok Free Float Rail. The KS-47 G2 upper will not work with a standard AR-15 lower. When will the stripped lowers be available? BEST ANSWER: They will need to sell it as a stripped upper/lower set since the upper is customized to work with the KS-47 lower. I hope they release these sets soon. They didn't sell it as a set 2 years ago when I bought mine. I had to find a upper with enough extra material to machine it to match. What is the weight with empty magazine? BEST ANSWER: 5lbs 14oz - no mag, 6lbs 5oz with pmag. So does the KS47 Gen 2 with the SBA3 pistol brace still have a PA-10 buffer spring and a H1 buffer? BEST ANSWER: Yes, PA-10 carbine buffer spring and heavy H1 buffer. It states this above in the description of the components. Anyone have experience shooting this with a suppressor, how does it work with sub and supersonic? BEST ANSWER: I dought it would function with subs unless you open the gas port to .125. Then you will want an adjustable gas block, or piston so it's not over gashed with supers. Dude please learn how to spell. Is the gas block pinned in place? BEST ANSWER: No, just set screws. I removed and added locktite. hey which Locktite did you use ? BEST ANSWER: No, as stated in the description. AR-47 meaning an AR-15 lower using 7.62x39 AR magazines in this case. The Gen1 upper was dual compatible due to not having the over insertion tabs, but this creates some operational weakness that the tabs are meant to prevent. Since most anyone buying a KS47 is doing it because they want to use AK mags, adding the tabs on the Gen2 is the right choice in my opinion. Is the inside of the barrel nitride treated as well, or just the outside? will uppers be available for those who bought ks47 lowers during the first run? 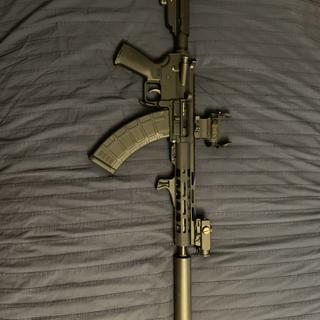 Does this gun accept standard ar rails and .750 gas blocks? BEST ANSWER: Yes, the components that are different are the upper itself and the lower. All other parts are mil-spec. what is the overall length of this pistol with arm brace? BEST ANSWER: 26 3/8" will brace fully collapsed, 29.0 with brace fully extended if you're shopping for an appropriately sized case. BEST ANSWER: No. This only works with the PSA KS-47 upper and lower. How is it to clean? I know AK ammo can be dirty and curious how it is to clean within a DI system? thanks! BEST ANSWER: I’ve shot a mix of all kinds of steel cased ammo. It did not seem any dirtier than a normal 5.56 AR15. I was surprised. Depends on what flavor 7.62x39 you shoot.Not really any dirtier than any other ammo. Shoot it today, clean it today! BEST ANSWER: Only if you use Dianne Feinstein's head between the brace and your shoulder. BEST ANSWER: 26 3/8" will brace fully collapsed, 29.0 with brace fully extended. 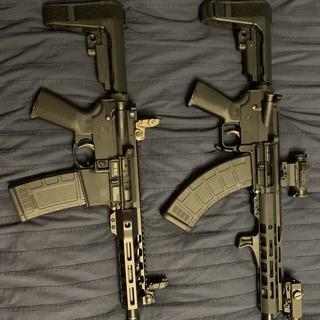 Aside from asking PSA,which I will has anyone used East German or Polish AK 762x39 magazines woth no issues in this KS 47 AR Hibred pistol? BEST ANSWER: this "Hybrid" KS-47 functions fine with PMags, it lists others that will work. Not on the list?, then prolly not. Does the KS-47 bolt lock open on empty magazine? Will surplus Polish magazines and Hungarian tanker magazines work? BEST ANSWER: My surplus Polish steel mags fit perfect. If the dust cover can't be latched closed what's the point in including it? Can I get 7.5" barrel KS 47 G2? What is the bore diameter for this rifle? .308, .309, .311? 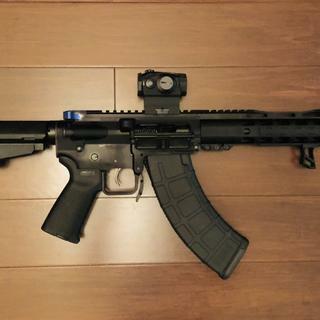 Will this pistol function with a Toolcraft NB 7.62 x 39 BCG? BEST ANSWER: I tried it. It will not. The BCG will hang up on the mag, no matter what type. Is it made for use with ak mags? 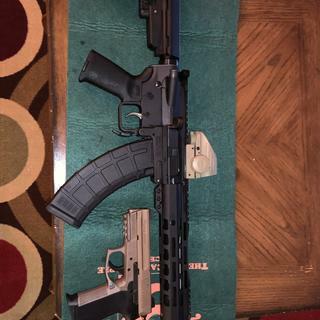 Will my S&W 5.45x39 upper will work with this lower? BEST ANSWER: Probably not. A "mil spec" AR-15/M-4 upper is NOT milled out for an AK mag. Will an echo trigger work with this gun? Or you could contact PSA. PSA stated in the video above on the KS-47 that it will not work with cassette style triggers and the Echo is kind of a cassette style trigger. Any trigger will work as long as it is NOT a drop in trigger. 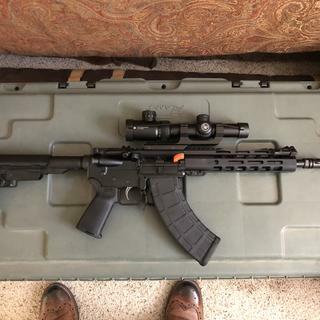 Will this thing eat dog food steel cased ammo like an AK can? Which adjustable gas block will fit this upper? Will the KS47 lower work with other brand name AR type AK uppers? BEST ANSWER: No, probably not. These uppers and lowers are "proprietary", meaning they differ just enough from each manufacturer so as to be incompatible with each other. The only other companies that make these style are CMMG and Rock River Arms. Is the bolt carrier assembly the same specs and dimensions as a regular 5.56 BCG? BEST ANSWER: no this is a hybrid bolt carrier. Will a Law Tactical Folder work with this as is? BEST ANSWER: Yes, because it uses a mil spec buffer tube. 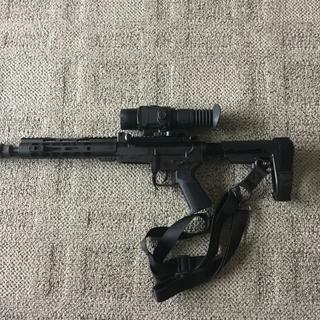 Would the Strike Industries PDW Stabilizer work with this? Great build quality. Fit and finish is perfect. I’ve fired close to 200 rds of nothing but steel case without a hiccup so far. Awesome!! I took this weapon out and put it through my normal tests which include a variety of ammo and mags. All ammo functioned very well with no problems. This weapon has great accuracy for a shorter barrel length. The only issue that I encountered was with the mags. The Pmags work extremely well but all others watch out. 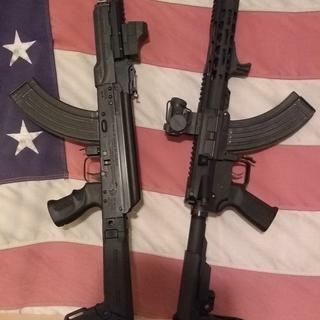 I have fired just about every make of AK from when I was in the military to civilian life and have encountered a few picky AK's here and there...this one gave me the most seating problems. I used Hungarian, East German, Croatian, Polish, South Korean, and Bulgarian...none of these would properly seat into the receiver...Love the weapon but hate the limitation due to it's picky eating habit. Lucky I have a good number of Pmags for this one. Doesn't like tapco mags, they just won't fit! Steel, and Magpul mags work great. This is the perfect do everything pistol!!! The KS47 10.5” pistol is the perfect package. This pistol was delivered ready to rock and that’s exactly what it did!!! 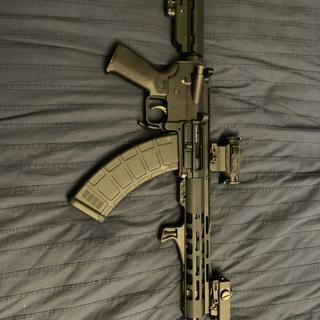 Here is what I’ve added to mine: Holosun 515CU red, Strike Industries charging handle, BCM Kac foregrip, Gemtech HVT suppressor and brake, and a Holosun L221G IR/visual green laser. 200 rounds fired. Excellent fit/finish. Everything is tight. Functions perfectly with a variety of mags. Very happy. I shot about 200 rounds today of a bunch of different kinds of steel cases ammo. Not a single malfunction. Very fun to shoot. Lightweight and surprisingly low recoil. Less than my AK. I took it apart, cleaned & oiled it right out of the box. I also Locktited & retorqued the gas block screws from reading other reviews. I used the supplied Magpul mag and an old steel surplus (unknown make) mag. Both worked perfectly. The steel mag snapped in great. The Magpul mag fits very snug. I added a Strike Ind. extended charging handle, Utg hand stop and mounted a Sig Romeo 5 red dot. Now I just need a weaponlight. The trigger is good for a mil spec type. Scaled at 5.5lbs and has gotten smoother with use. Glad I bought this. Love fit and finish not a single feed issue or loose gas block...but 130 rounds of wolf and it became a single shot.I had to mortar 2 fired rounds out of battery before I gave up for the day.Got home and cleaned chamber good over all it was not that dirty.I hope this is break in.If it repeats I may send it back for inspection.Not to happy the day I received it I got an email showing I could have got it cheaper by purchasing separate upper from lower. First thing I did when I received the pistol was to check the gas block screws. They were a half turn loose IMO. Added some blue loctite fired 100rds and no problems with magpul, surplus steel and circle 10(tight fit) mags. Added an extended latch charging handle since there is no bolt hold open. Getting 2.75 - 3" @100 with Wolf mil-spec ammo (red laquer). Much like the 2 Star review above me, my gas block came loose on about round 100. I remember reading the review, popped off the handguard, and both set screws were loose with the block out of place. It was a really easy fix, sort of, but the screws are too long to really stake properly. Yeah, I can file them, sand them, whatever, but getting the right length set screws isn't a big deal. Thanks to the original poster for letting us know what to look for in case of problems. OTHER THAN THAT, I love the pistol. It's great fun to shoot. I don't regret the purchase. P-State, come on guys, you have a publicly listed problem and it's recurring? Love your stuff and love your prices, but this seems like an easy fix. I haven't shot this gun yet but it sure does look cool and feels very well built. Once I shoot it I will update my review. I absolutely love this gun, the stock sits firmly in my shoulder and as I fire it locks in and feels great. 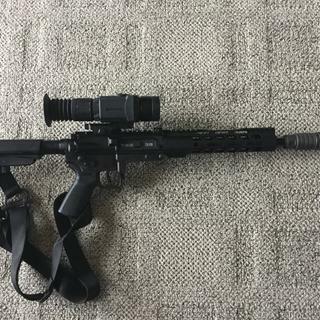 Put some accessories on 45 degree site mounts (short arms) and magpul iron sights, I have taken it for a couple of runs and have got might sights the way I want them and it fires flawlessly with accuracy I just love. Love this gun, have waited for it to cycle back into stock, so glad I waited. Gas block came loose during 3rd mag, bent charging handle. Gas block came loose after 3 mags and turned the gun into a single shot. Some cases got stuck in the chamber while troubleshooting this issue and I bent the charging handle clearing stuck cases. First time I have bent an AR charging handle despite being an abusive user. If you buy one of these, tear it down completely and re-torque or loctite everything with a thread on it. Palmetto, if you are not going to pin the gas block you should dimple the barrel for the setscrews and loctite the set screws. Since the gas block came free and slid forward off the gas port within 3 mags I think the person assembling the gun didn't even tighten the screws. When aligning and re-installing gas block I did not see usual screw marks on the bottom of the barrel. After fixing the above issues on the firing line I was able to put 400rnds through the gun in a couple hours. - Dimple the set screw locations on the barrel. - Loctite the gas block set screws. - Install short barrel flash hider. Took the PSA Gen 2 Pistol-length ks47 out today for a test. I tried some bakelite mags and some eastern european steel mags. Not a single feeding issue. Put ~360 rounds of wolf through it. Had one round that did not fire but checked and it was not a lite strike. I then loaded round again and it fired. The gun is a lot of fun. It seems very well built. It will get hot so make sure to wear some gloves if you are going to put a lot of rounds through it. Write your review here. It must be at least 20 characters lonOne week from order to receipt. Cleaned and lubed. Affixed MBUS and Eotech sights, and a sling via detachable swivels and weapon fixture/sockets. I also installed a PSA ambi- safety which was a two minute drop-in process. During my initial outing I ran 400 plus rounds of assort steel ammo - Wolf, Tula, Red Army, brass surplus - a mix of hollow points and FMJs. Not a single failure of any kind. The magazine lockup on surplus and new alike was positive and rock solid. I used Magpul composites, Russian, Croatian, Korean and Bulgarian and Hungarian steel 30's. It also ran Russian 20 round magazines w/o hesitation. I had two Romanian 40 round magazines and they ran without hesitation. The only issue was with a 75 Round Drum; which was wobbly and did not fit the mag. well. This "pistol" is a riot to shoot - and runs like a sewing machine. It is accurate and seems to be well-mannered - its loud but not obnoxious, negligible recoil as fired from the shoulder with supplied stock. All my assorted magazines fit well and fed 100% (with the Century Arms drum being the exception). Great purchase - my new truck gun.g. Consider whether you would recommend this product and what you like or dislike about it.